The National Urban League Conference, presented by Toyota and Nationwide, occupies a singular echelon in America’s cultural and political discourse. The nation’s largest civil rights and social justice conference attracts thousands of the nation’s most influential community leaders together with top policy-makers, academicians, business leaders, and artists for fourÂ days of dynamic dialogue, intellectual exchange, and community service. The conferenceÂ featured family-focused Community Day for theÂ localÂ Baltimoreans, which includedÂ entertainingÂ exhibits and sessions. 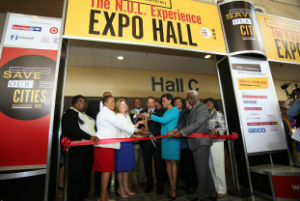 In addition to the exciting exhibits in the N.U.L.Â Experience, the Expo Hall included free health and wellness screenings, workshops, forums and panel discussions focused on job creation, education, health, housing, and civic engagement. At the Small Business Matters: Entrepreneurs Summit, which is focused on the themeÂ “money, marketing, and management,â€ small business owners and those hoping to start businesses also had the opportunity to compete in the National Urban League Conference Pitch Contest.